Enhanced Abilities: The Weaponer has superhuman strength, endurance and durability. Qwardian Power Ring: Members of the Sinestro Corps use yellow power rings built on Qward and are fuelled by fear instead of willpower. The rings can create constructs based on the wielders own thoughts, produce energy blasts, generate force fields, instil fear, render the wearer invisible, allow them to phase, fly, absorb energy, translate languages, create spacial warps and even regenerate health in a limited way. Shield: The Weaponer has a specially crafted shield formed from energy remnants of a White Lantern Power Ring that was laced over its golden form as a net of White Lantern Energy. The shield has the ability when commanded to analyze an opponent by threat level, allowing it to detect any weaknesses within a foe for the Weaponer to devise the perfect countermeasure. Working in conjunction with the scanning function, this device was capable of imparting its energy on another weapon and reconfigure its form into a more suitable countermeasure for the wielder to use against enemies. This has transformed The Weaponers hammer into a gun that shoots spikes and later moulded itself into a gun that fired white coloured insects to incapacitate a foe. When commanded, the shield is capable of teleporting the wielder to different locations. 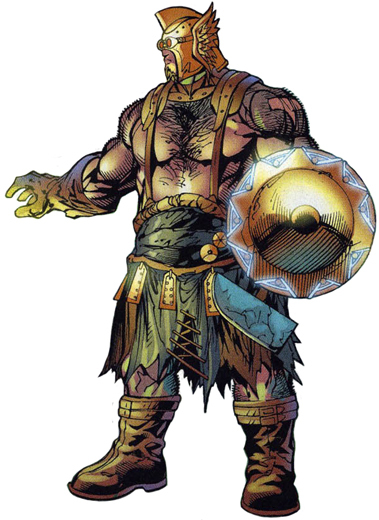 The being known as The Weaponer was a denizen of the Anti-Matter Universe; a dark counterpart of the Positive Matter Universe where he was born to the race of beings known as the Qwardians. Native to their home world of Qward, he joined the ranks of their esteemed Weaponers of Qward. Many years ago, his world was visited by the renegade Green Lantern known as Sinestro after he was banished to the Anti-Matter Universe by the Guardians of the Universe. Upon arriving on Qward, the native of Korugar sought out The Weaponer and asked him to forge him a weapon with which he could get his vengeance. Initially, The Weaponer was incapable of completing this task not because he lacked the skills but because Thaal Sinestro was bereft of trust which meant that the creation of such a device was not possible initially. However, he let go of his pride and told The Weaponer about the Oans Green Lantern Power Ring's as well as his desire to possess a similar such weapon. After being convinced to speak of further secrets, The Weaponer started his forge and began making a Power Ring suitable for Sinestro's purposes. Learning that vengeance would never be his unless he told the Qwardian everything; The Weaponer thus came to know everything about Thaal Sinestro as a result of their time together. The Weaponer's shield forged from The White Light, with the possibility of achieving his goal, any fear Sinestro had of The Weaponer was gone as the being forged the first Qwardian Power Ring. To achieve the process, the Qwardians had to slowly extinguish the life of an entire species in their universe and collected the distilled terror they faced in their final days. This was because the Weaponers of Qward honoured their commitments and expected much from Sinestro in turn as they gave him a weapon with which he could achieve his revenge. In the aftermath of The Blackest Night, the Qwardian people had fallen on hard times as they became enslaved by Sinestro who forced them to create large number of Qwardian Power Rings in order to arm his Sinestro Corps that had harnessed the power of fear within the Emotional Spectrum. During this time, The Weaponer was still alive and witnessed a great battle between the Anti-Monitor and a human that wielded a White Lantern Power Ring. Following the battle, the human disappeared and the Anti-Monitor departed the scene allowing The Weaponer to investigate the site. There, he discovered the remnants of the White Lantern's energy in the form of a Lantern Energy Construct that still contained traces of The White Light. Taking this energy, he began to study it in order to harness its power as he had never encountered its like before. With it, he managed to lace the energy he had recovered on a shield that he had fashioned for himself. This would become a unique weapon in his arsenal with which he intended to take revenge against the fallen Green Lantern; Sinestro.